In our most recent apartmentiversary post, I mentioned that I really wanted some sort of ottoman or short table to cover up the row of outlets in between the two windows along the far wall. They’re so prominent, they drive me bonkers. I mean... maybe they didn’t seem prominent before. But now you can’t stop noticing them, right? Welcome to my world! So I’ve wanted a ottoman or other small bench or table in that spot since I put the furniture in this room over two years ago. 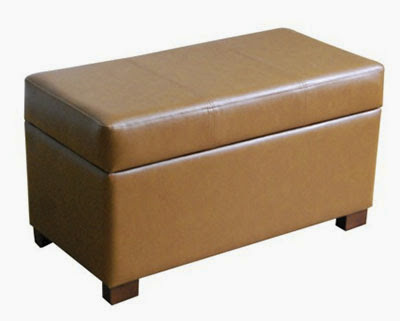 But because ottomans seem to cost so much for so little (a hundred bucks for a short little upholstered table? Really?) I didn’t think I could justify it. I looked into all sorts of inexpensive DIY solutions, like upholstering a foam cooler (totally not joking) just to scratch those itches of exposed outlets. But then! Then I learned I had to move all my clothes out of the guest room to make room for a new member of Team P. Not just wanted to, had to. And with that, the purchase of a storage ottoman for that spot seemed all the more justified! It was even prettier in real life than in the photo – the fabric is actually more of an off-white linen, and the shape just suited the room. But there was one measurement I’d failed to consider: depth. See, I wanted to use this for shoe storage, and it made sense to store my shoes vertically so I can see all of them at once. Unfortunately, I knew from measuring (“measuring” = taking my shoes off in the ottoman aisle at Target and sticking them in the display ottoman, because klassy) that this one just wasn’t deep enough. Ninety dollars felt like a lot to pay for something that couldn’t function exactly what I wanted. I’d have to store my shoes at an angle, so it wouldn’t be able to hold as many pairs. So... I walked away. Actually, no. I walked about ten feet. And there I encountered another ottoman I’d totally overlooked on the website because it looked big and blah and... orange. But believe it or not, in real life it appeared to be more of a lovely caramel color. And it was deep enough to hold my shoes. 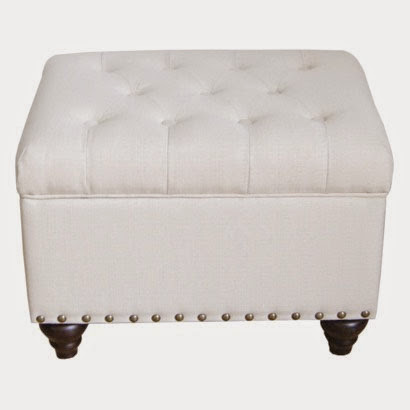 AND it was ten dollars cheaper than the smaller white ottoman! Once I’d confirmed that it wouldn’t be too wide, I realized I had myself a Goldilocks of a shoe storage ottoman. Hooray! I got this before we painted (like... weeks ago... and still need to remove the tags) and wondered how the tan would look in our eventually-gray bedroom. 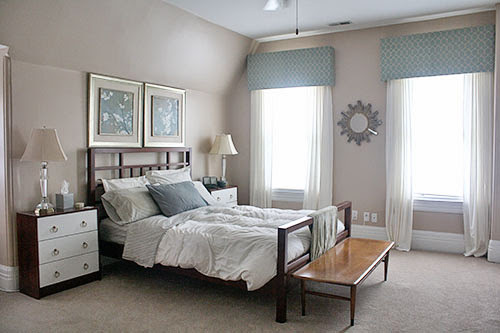 But it plays nicely with the wood furniture, anchors the room with a deeper tone (instead of white, which I’m usually drawn to), and warms up the gray walls. It’s totally different from what I thought I wanted, and yet exactly right for this space and its purpose. 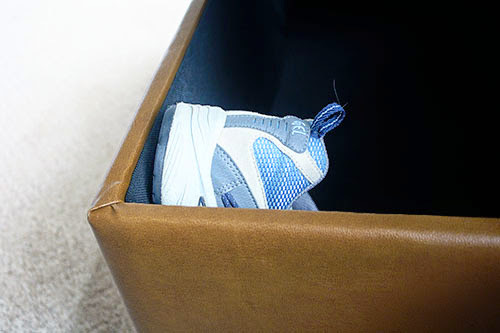 Even my bulky running shoes aren’t too big to stand vertically inside this ottoman. 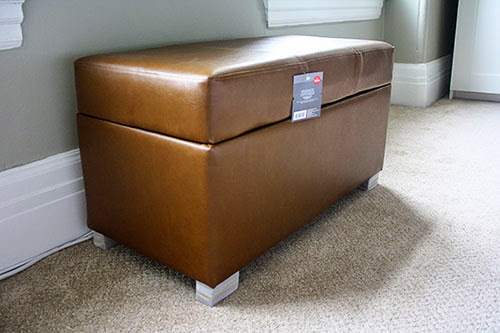 As for how to turn it into an actual shoe storage ottoman... well, I’m still exploring my options there (brackets? pockets? throwing them in there and hoping for the best?). For now I’m happy to have extra space for the great wardrobe transfer... and to have finally covered up those stupid outlets! Would it be possible for you to get a shoe divider like this and make it fit? @Rachel, I've thought of building one like that, actually! But I'm also toying with an idea that takes up less space and is more flexible... we shall see! How about instead of putting the shoes in like the demo shot of the tennis shoe you go along the length of the ottoman. How to separate the shoes? 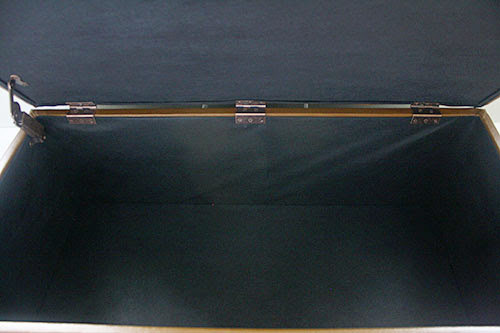 How about using tension rods you'd find in the curtain section of the store? You can get them the right length you need. Two rods provide 3 rows of shoe space. Shoes lean against the rod and remain standing. 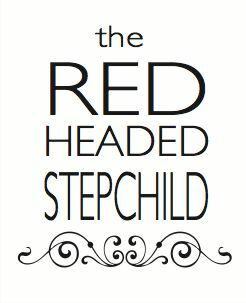 Unless of course you have flats, they might have trouble standing up anyway. Then you'd need some sort of shoe tree thingy to support them. Just a thought. :) Hiding outlets? We just painted them the same color as the wall. Works great but sometimes can be a bit of a challenge to FIND them when you need one lol.